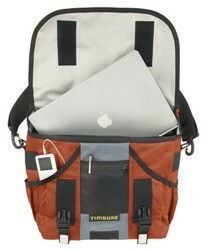 Review – Tough & Tidy: Timbuk2's Commute XL a Commuting Joy! I’ve been a Timbuk2 believer for a long time, since their early days making tough bags that really were used just by bicycle messengers. Like khaki pants with their military heritage, these bags went from specialized service to popular product, with a little re-engineering on the way. I’ve had my old Timbuk2 basic messenger bag for a while — indeed, it must have been a while, since it’s a domestic model, whereas the new one I’ve been testing, the Timbuk2 Commute XL is a product of that amazing “workshop of the world,” Mainland China. "The difference is mostly cosmetic; both materials provide maximum durability. Our Ballistic and Cordura fabrics are selected for their superior strength, abrasion resistance, and color retention compared to less-expensive, less-robust polyester fabrics. Both fabrics consist of high-performance, 100-percent nylon and are back-coated with polyurethane waterproofing. The Ballistic has a higher sheen, brighter colors and a smoother surface that won't pill your duds. Cordura® has a finer weave and matte finish, for a traditional, more rugged look. In sum, your selection is largely a matter of personal style." The Commute XL, however, now is available only in the “Ballistic” nylon; you don’t get a choice. Yet in daily use, regardless of the nylon, I’m happy with this new bag; it’s still a tough, flexible product that handles heavy loads with ease. Some might pause at paying $120 for this bag, but with its solid construction it’s going to last you a lot longer than cheaper bags — you’re also paying for very good engineering. The Commute XL has a number of interesting features, most of which are well-designed and useful. Let me start with a few quibbles, however. For one, I have an issue with the strap: I really prefer what Timbuk2 calls its “signature side-cam quick-adjust shoulder strap.” That’s what my old bag has, whereas the Commute XL has what seems to me to be a less sturdy arrangement with D-rings coupled to wire and plastic J-clips. And I know this seems particular, but I really wish that Timbuk2 would phase out the Velcro pads used to shut the bag. Are they really necessary? The straps seem to me to be sufficient! My colleague Harris Fogel, takes the opposite view, and says that, “I love having the combination of the Velcro and the straps... it’s one more way to keep your stuff from falling out and to seal out the weather!” My reply to him is that your bag shouldn’t be so over-packed! Other than that small quibble, the features of the Commute XL are sensible and functional. Most notable is the built-in compartment for a laptop computer (it’s designed to fit a17-inch Apple MacBook Pro). It’s padded with a nice corduroy finish, which won’t scratch your computer, as nylon sometimes can especially with a plastic bodied laptop, such as an MacBook, since plastic upon plastic is often very abrasive. The bag also has both a padded back panel, which makes cycling with it more comfortable, and a rubberized bottom made of Hypalon, the same material used in Zodiac boats, which protects whatever you’ve got in the bag from a possible impact from dropping it. Inside, there are all kinds of pockets for pens, keys, a cell phone, and so on. I also like the fact that there are two good-sized zippered pockets inside, perfect for a small notebook, passport, etc. The features that please me the most are the carrying handle, something I had felt long ago would be a nice addition to Timbuk2 bags generally, and the water bottle pockets, a real must for the person running around on business or errands all day as I often am. You can get the Commute XL with all three panels in black — my favorite — or in the following combinations: orange-silver-orange, silver-white-silver, and what the company calls “slate blue”. I always prefer black because (a) it hides the dirt and wear, and (b) it goes with whatever I might be wearing. For me, the Commute XL is a very convenient bag for — as its name implies — commuting, especially with the laptop compartment. But it’s also nice as a travel bag, particularly as a modest carry-on for someone who’s going to do a bit of work on an airplane.